Johannesburg, South Africa (CNN) -- The World Cup often sees soccer played in some of the most exotic locations on the planet, but few that are quite as notorious as the Zonderwater prison in Pretoria, South Africa. It was in the confines of this jail -- in a bid to prove the "beautiful game" can touch even those living behind bars -- that a team of inmates took on a side of traveling England fans to mark their country hosting the 2010 tournament. 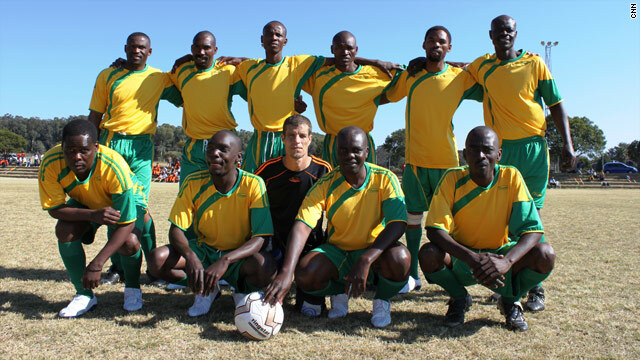 The "Kopano Challenge Champions" title was at stake for the team of convicted criminals who were captained by Thobi E. Qekisi, a former death-row prisoner who was sentenced for murder and robbery in 1985. Not that Qekisi showed signs of nerves prior to kickoff, urging attacking play from his side -- which he ordered to line up in a 4-4-2 formation. "Today we are going to kill these people," the 48-year-old told CNN before the game, in a team talk that may have worried some of the English opposition. "We are going to play 4-4-2, because that's our preferred pattern. Our midfield is strong and my strikers are sharp, sharp so I think we will win. "We have prepared so much for the game because we know this is a one-chance-in-a-lifetime situation -- that is why we have prepared so thoroughly," Qekisi added. The match was just the latest event set up by a prison that aims to use sport to rehabilitate inmates, many of whom are approaching release and reintegration back into society. "Building bridges the Diski way" -- Diski being the local name for soccer -- is a project that has been helping men like Qekisi for more than two years, according to Simphiwe Kondleka, a spokesperson for Gauteng Correctional Services. 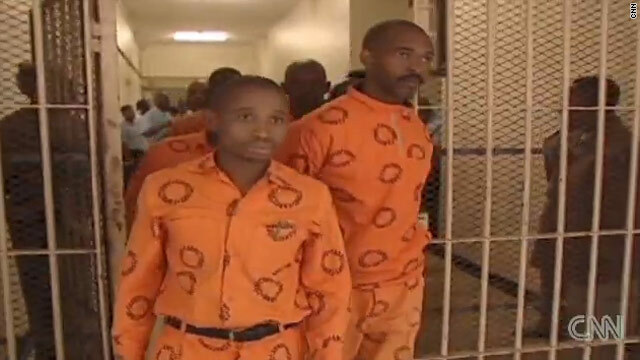 Qekisi was due to hang for his crimes before Nelson Mandela's newly-formed government abolished the death penalty in 1995. He has applied for parole on the life sentence he is serving at Zonderwater, but though his freedom has been curtailed for the time being, his passion for football lives on. "I feel so happy that South Africa is host, I don't know what else to say about the World Cup. It's fantastic we're watching all the games in prison. I've been waiting for this for so long and now it is here!" Fellow inmate and prison youth player Nkosikhona Mteshana, 28, who has been behind bars since 2003, was also confident about the senior team's chances against the English. "We will attack, attack and attack them until we score goals," he said before the two sides lined up to sing their respective national anthems. "Our midfield is very strong, and that is where the game will be won and lost." David Hancock, the captain of the fans' team, said the match was a way for England supporters to help lose their "hooligan" image. Green blunder costs England victory against U.S.
"I've played for a couple years in a variety of places, from playing Arabs in the West Bank to playing here in a South Africa prison. It helps [say that] actually we're not a bunch of hooligans; we're actually here to put something back into the community. "Though I am a little bit wary about giving publicity to people whose crimes are quite bad. However, you could say that everyone deserves a second chance and these guys are nearing their release, so it's a good reward for them," he added before taking his place in defense on the dusty pitch. A crowd of inmate spectators -- among them Daniel, who is serving a 10-year sentence for robbery, and a friend who was sentenced for assault -- watched and cheered, dressed in orange prison fatigues, as their side ground out a 2-2 draw with their foreign opponents. The result meant the title would remain with the prison side. As, no doubt, would the memories of the day they played England in the year South Africa hosted the World Cup.